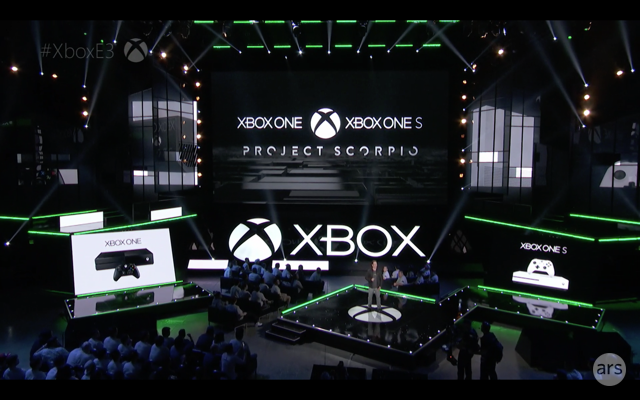 Microsoft Teases Project Scorpio for 2017: 8 cores, 6 TeraFLOPs, Backwards Compatible with Xbox. Zen or Jaguar?! This news piece contains speculation, and suggests silicon implementation based on released products and roadmaps.The only elements confirmed for Project Scorpio are the eight cores, >6 TFLOPs, 320 GB/s, it's built by AMD, and it is coming in 2017. If anyone wants to officially correct any speculation, please get in touch. Here’s an announcement at E3 for you. Microsoft just announced Project Scorpio, an internal project to develop the next generation Xbox set to be released in 2017. Project Scorpio is to be backwards compatible with Xbox One, and seems to be directly in line to compete with whatever Sony are supposedly releasing in the near future. But here’s some specifications for you that has my mind in a twist. In the presentation, Microsoft states that the Project Scorpio SoC will have eight cores, up to 320 GB/s of memory bandwidth, and over 6 TeraFLOPs of power. To put this into context, this is more processing power than the recently announced AMD RX 480 GPU using a GCN 4 based architecture, set to be launched later this month. Microsoft specifically announced that Project Scorpio is to be launched next year, which puts a few things together worth mentioning. By this time next year, we expect AMD’s Zen microarchitecture to be in full swing, and AMD has already showcased a silicon sample of an 8-core Zen processor. However, the current Xbox line relies on AMD’s ‘cat’ core architecture, which according to current AMD roadmaps doesn’t seem to feature anywhere for 2017. Without a direct confirmation, it’s hard to tell if Project Scorpio is the same Jaguar cores as the Xbox One, or the newer Zen microarchitecture. I would assume we won’t find out until later next year. CPU Cores/Threads 3/6 8/8 8 / ? CPU Frequency 3.2GHz 1.6GHz (est) ? CPU µArch IBM PowerPC AMD Jaguar ? Shared L2 Cache 1MB 2 x 2MB ? Embedded Memory 10MB eDRAM 32MB eSRAM ? Embedded Memory Bandwidth 32GB/s 102GB/s ? System Memory 512MB 1400MHz GDDR3 8GB 2133MHz DDR3 ? System Memory Bus 128-bits 256-bits ? On the GPU side, the current Xbox One uses a 16 CU implementation in the SoC, with two disabled giving 14 CUs. We already know that AMD’s RX 480, running at 5 TFLOPs and built on Global Foundries 14nm FinFET process, runs in at 36 CUs. So Project Scorpio will have easily have more CUs than Xbox One, and judging by the shots in the video, the die size is relatively small. The Xbox One was built on TSMC’s 28nm HP process. At this point it’s still not confirmed if this is an AMD win, however judging by the comments towards backwards compatibility and SoC integration (where CPU and GPU are on the same silicon (or package)), all fingers would point in that direction. The memory bandwidth of Project Scorpio, 320 GB/s, is also relatively interesting given the current rates of the RX 480 topping out at 256 GB/s. The 320 GB/s number seems round enough to be a GPU only figure, but given previous embedded memory designs is likely to include some form of embedded memory. How much is impossible to say at this point. AMD has stated that the RX 480 is a VR Gaming capable card, so given what we've said about the Xbox One S tackling VR, it's clear that Project Scorpio is right on the money. AMD's business plan as of late is to expand its custom SoC business, and thus sticking Zen and a GCN 4 based architecture on a combined package or die for Microsoft makes a lot of sense. At the RX 480 announcement, it was stated that AMD wants to power the first 100 million VR users, and this would help towards that goal. It's worth noting that this news piece contains a decent amount of speculation based on knowledge of the market, and the only elements confirmed for Project Scorpio are the eight cores, >6 TFLOPs, 320 GB/s, and it is coming in 2017. If anyone wants to officially correct any speculation, please get in touch. Additional: We can confirm that Scorpio will be an AMD based design, as expected. A bit small for 2017. At that point they should target 4k gaming and higher res than current headsets VR.